14OZ DOF GLASS - 14 oz. 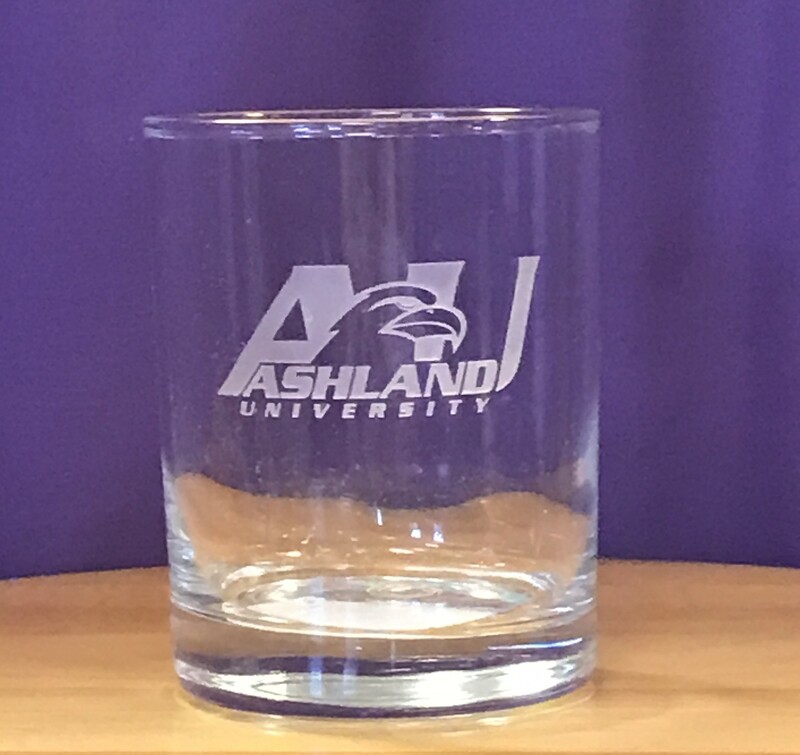 Double Old Fashion glassware with an etched AU logo. 14OZ PUR DOF GLASS - 14 oz. 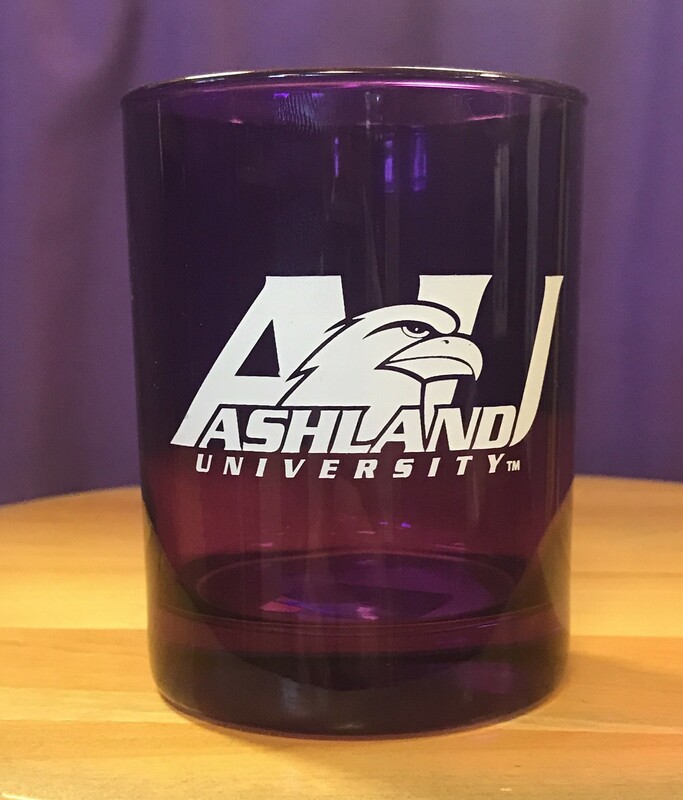 purple Double Old Fashion glassware with a white AU logo imprint. 15 OZ BLACK MATTE MUG - 15 oz. 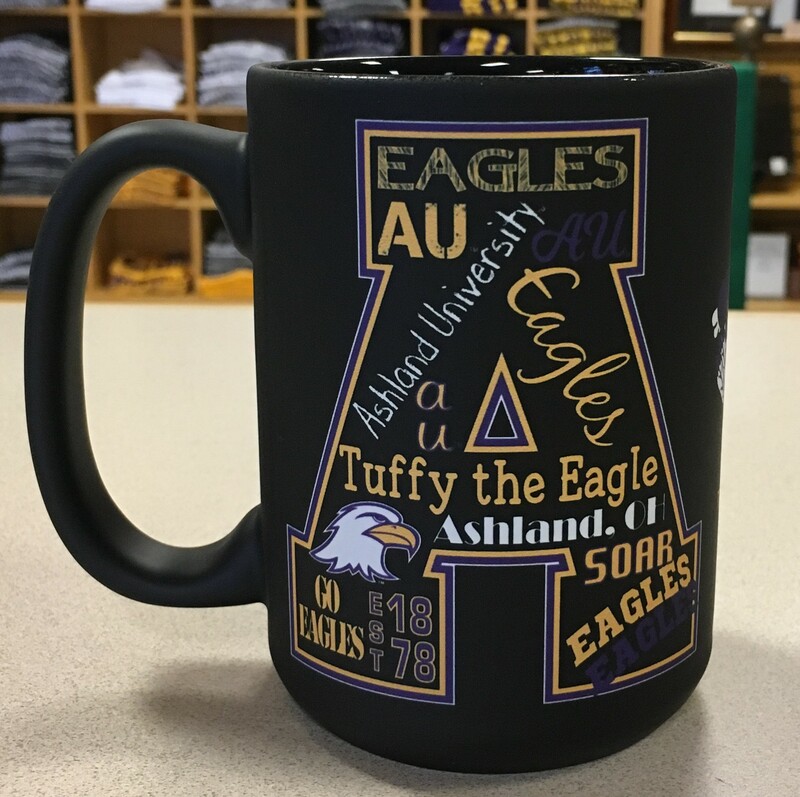 black matte finish sublimated mug with a "campus" wrap design using popular text pertaining to AU. This is an awesome mug!! 15 OZ TWO TONE MUG - 15 oz. two tone ceramic mug with a white exterior and purple interior with the ever popular landscape design of Founders Hall in purple imprint. 16OZ BISTRO MUG - 16 oz two tone bistro mug - purple outside color white inner color. Popular graphic using the State of Ohio, est. 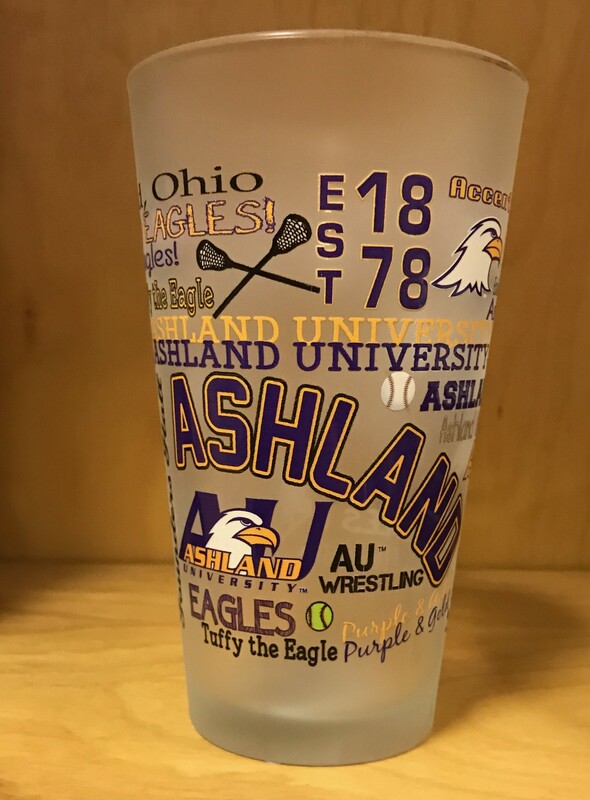 date and Ashland University in white. 16OZ FROST MIX GLASS - 16 oz frosted mixing glass with color power campus wrap design. 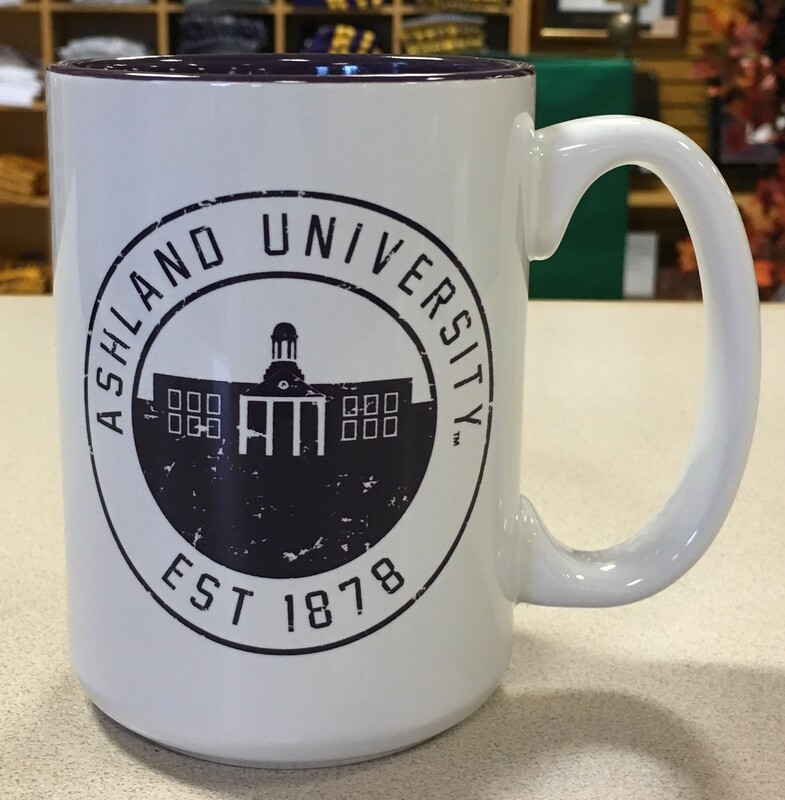 16OZ PUR ALUM MUG - Purple matte mug with Alumni Ashland University logo on the front and the AU seal logo on the back. This mug is 16 oz. 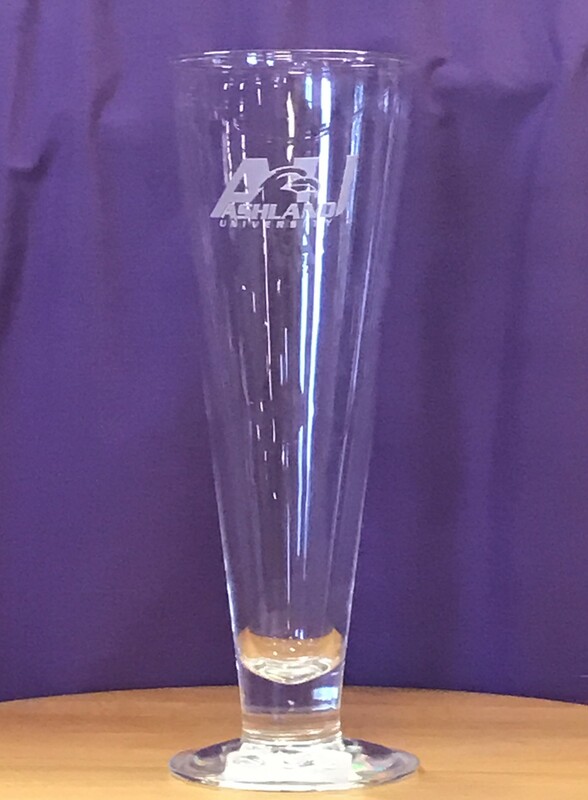 ALUMNI JV TUMBLER - 16 oz satin finish stainless steel purple travel tumbler with a black lid and slide closure. 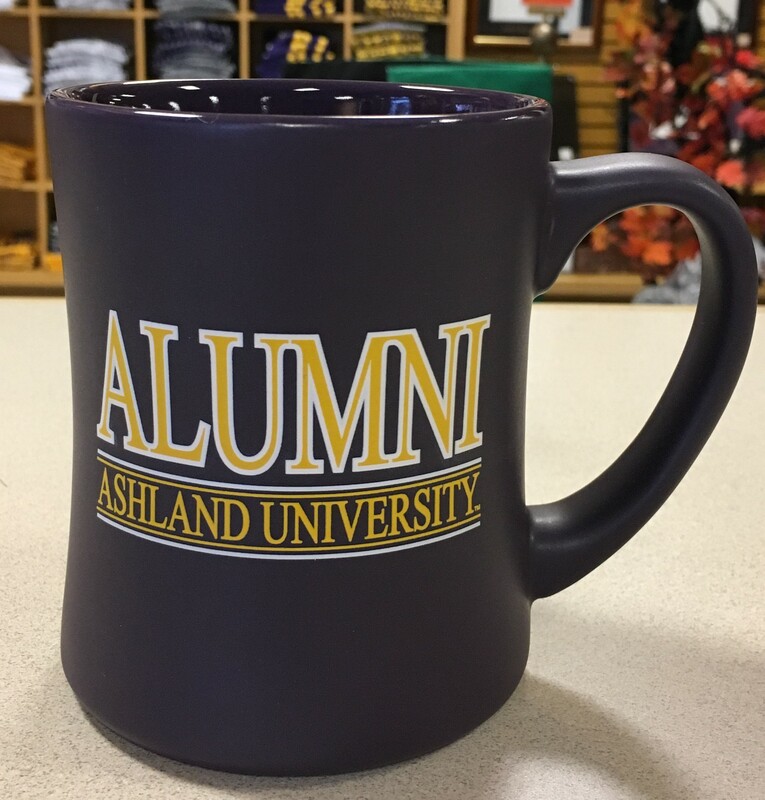 Ashland University Alumni imprint in gold on the front. AU MASON JAR W/STRAW - 20 oz. 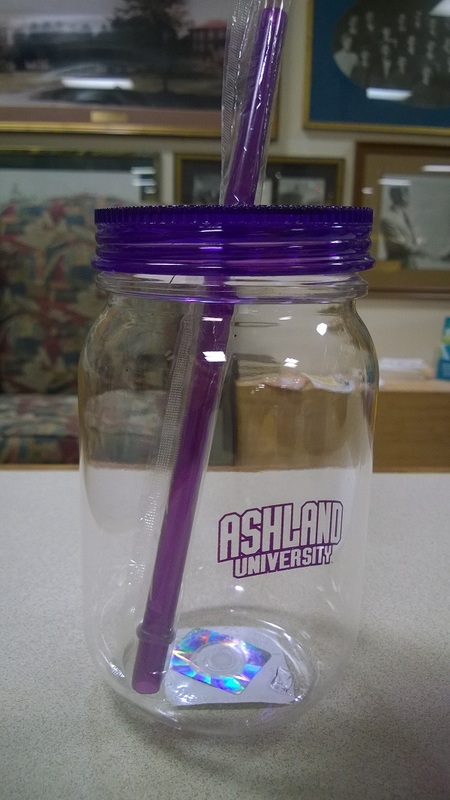 clear acrylic mason jar tumbler with purple lid and straw. CAMELBAK 25OZ - 25 oz. purple Camelbak water bottle. BPA, BPS, & BPF free. Dishwasher safe. Has a magnetic lid that keeps the cap out of the way while drinking. 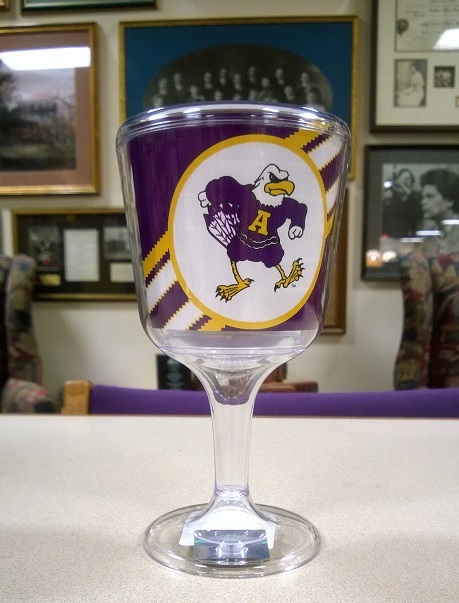 COLORMAX WINE GLASS - Acrylic stem wine glass with "Tuffy the Eagle" imprinted in full color. 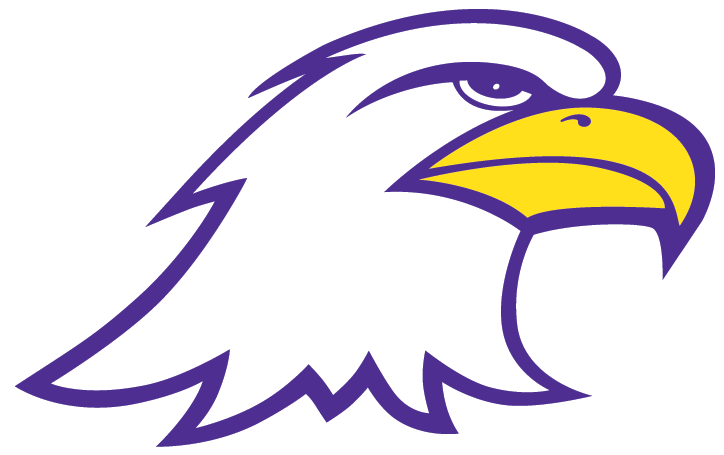 EAG NATION DECAL - Eagle Nation outside application window decal. 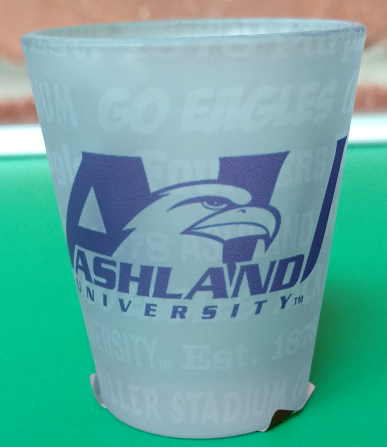 FROST SHOT GLASS - 2 oz frosted sublimated shot glass with AU logo in purple. FROSTED TANKARD - 16 oz. 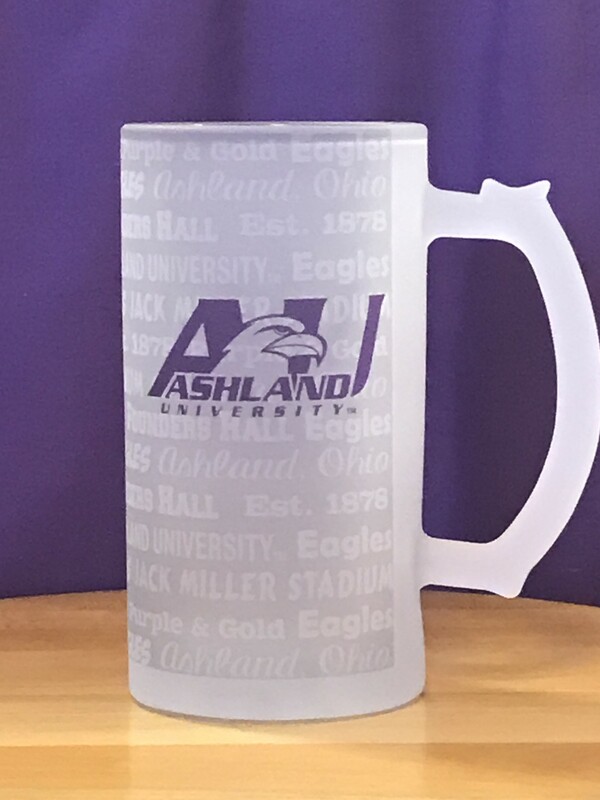 sublimated frosted glass tankard with a purple AU logo imprint. GOLD TUMBLER HANDLE - Gold 16 oz soft touch tumbler with handle. 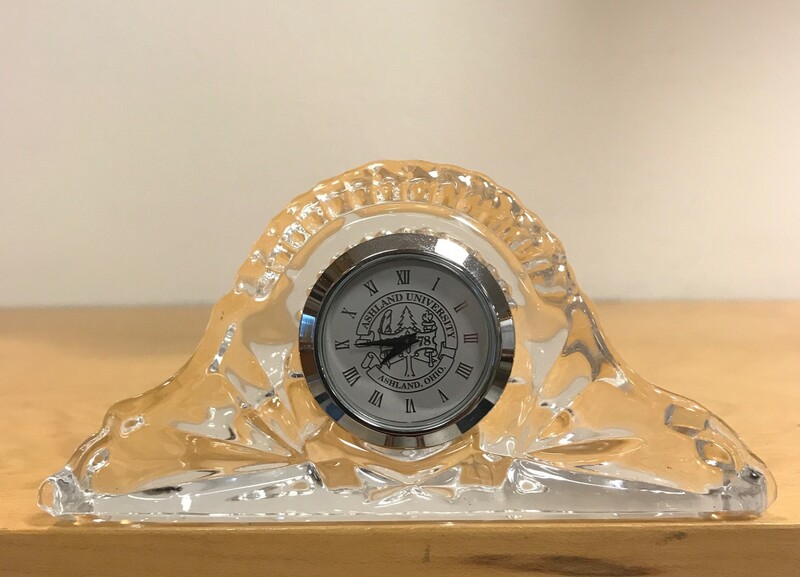 Stainless steel, doubled walled with AU logo imprint. 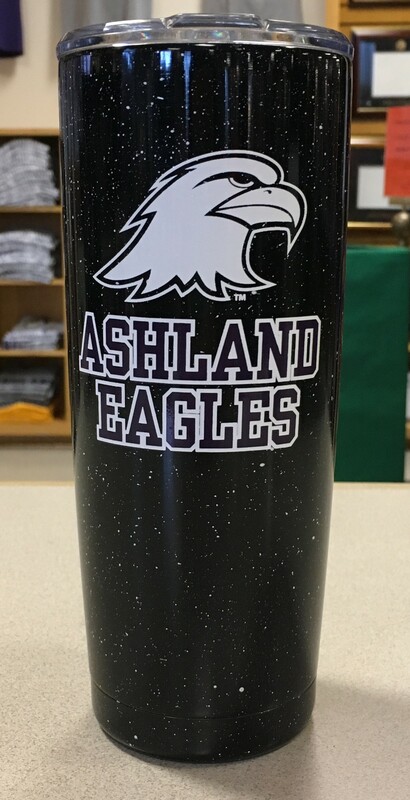 HIKER TRAVEL TUMBLER - 20 oz speckled black vacuum insulated travel tumbler with the eagle head logo and Ashland Eagles imprinted on the front.